I was stung by one as a child and I still love them. I always have to resist the urge to stroke them too! November 27, 2016 - 2:56 pm Marilyn F.
What a wonderful find for you to have bees in your wool!! I wonder what attracted them to it? Did you try to stroke the dead ones to see if they are as soft as they appear? Ah, yes, being stung by bees as a youngster always makes one fearful and cautious, but I don’t think honey bees are particularly aggressive unless they are threatened or are in a swarm. Although I think stepping on them is a fairly common childhood event when they are in the clover. Its yellow jackets and wasps that will attack and sting more than once, the honey bee has only one sting in it. But you probably know all this already. And of course as beautiful as the honey bee is – we all love what they produce – honey. Thanks for sharing. Ah, but these are bumble bees, a different species than honey bees. Our garden is visited by honey bees also, a neighbour keeps a few beehives. 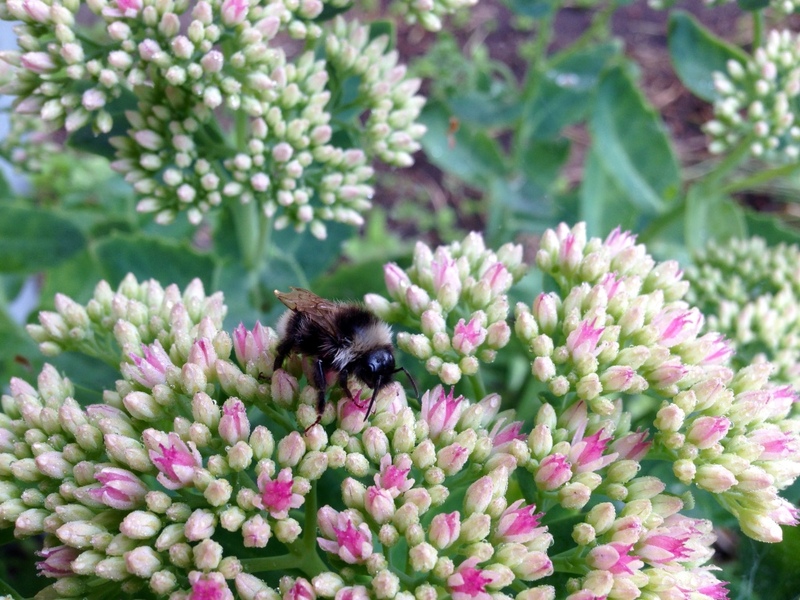 I counted at least 5 species of bumble bees last summer, all of them in that same flower you see in my blog post. Some were small, some really big. I also know now what the “pupas” are: empty cocoons that have been covered with wax and used as containers. November 28, 2016 - 2:06 pm Marilyn F.
Ah, it must be wonderful for you to be surrounded by so much beautiful nature with your 5 species of bumble bees and garden. Sounds like you have your own piece of heaven right there.